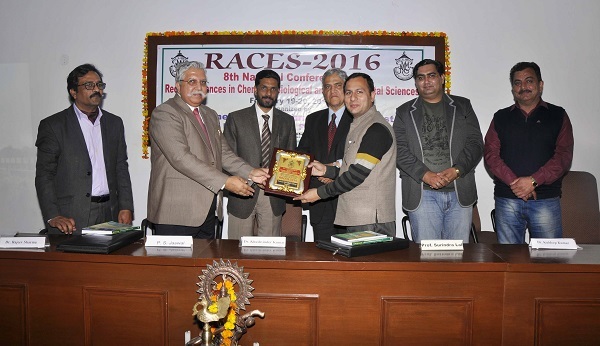 Prof. (Dr.) P. S. Jaswal, VC, RGNUL, Patiala presided over the Valedictory Session of the 8th National Conference on ‘Recent Advances in Chemical, Biological and Environmental Sciences’. He appreciated the initiative of the college in organizing national conference for the 8th year consecutively. He emphasized that the purpose of such initiatives should be to ignite the minds of young students for socially relevant quality research. Principal Dr. Khushvinder Kumar welcomed the guests and delegates. He appealed to the young research scholars to concentrate on the problems of their social surroundings while doing research work and make it related to real life situations. The third technical session started with Young Scientist Presentations by nine budding researchers pertaining to various sub-disciplines in science which elicited positive response from the delegates. 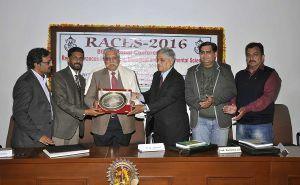 Prof. (Dr.) Neelam Verma, Department of Biotechnology; Prof. Gulshan Bansal, Dept. Of Pharmaceutical Sciences and Dr. Ashok Malik, Dept. of Chemistry, Punjabi University, Patiala judged the young scientist presentations. Dr. Charanjit Singh, Deputy Director, PPCB, Patiala and Prof. Harish Chopra, SLIET, Longowal judged the parallel poster session. The fourth technical session was chaired by Dr. Anil K. Sharma, Thapar University and Dr. Satish K. Bhardwaj (Former Principal). Dr. P. Srivastava, CDRI, Lucknow discussed the use of ‘scientoons’ in understanding scientific principles and the phenomena. Communicating science in the language of the masses has been a challenging endeavor for science communicators. He also said that Nanotechnology could prove to be a transformative technology in contemporary science. Prof. A.M. Deshmukh from Maharashtra spoke about the feasibility of microbes for management of Electronic waste. Imtiaza Khan, Divya Bhatia, Shilpa Nag, Nanita Rana and Seema were the winners in the Poster Presentation in Biological, Chemical and Environmental Sciences categories. Rajni Sharma was felicitated with Dr. K. C. Kalia Memorial Young Scientist Award in Chemical sciences, Dr. Ashwani Kumar was honoured with Dr. Lata Pabreja Memorial Award in Environmental Sciences and Dr. Kalpana Bhandari was awarded the Young Scientist Award in Biological Sciences. Prof. Surindra Lal, Former Principal and Member of the Management said that a true research scholar never complains of the scarcity of resources to pursue quality research. He also stressed upon the need to inculcate scientific temperament among young minds. He thanked the guests, delegates and the organizing teachers of the conference. Dr. Rajeev Sharma, Convener of the conference conducted the stage.